The Just Transition Alliance is proud to be part of the grassroots delegation at UNFCCC 24 in Katowice, Poland. Please read about our delegation’s goals, our events and support our efforts on Environmental and Economic Justice! As we head into COP24, the crisis of global warming and climate change has only become more evident as what could very well be the greatest danger to survival of humanity that we have ever faced. It is a crisis caused by a very clear, specific reason—the ongoing accumulation of greenhouse gases (GHG) in the atmosphere. The Intergovernmental Panel on Climate Change 2018 Special Report on Global Warming of 1.5°C warns that to stay below 1.5°C, “rapid and far-reaching” transitions in land-use, energy, industrial development, buildings, air, ground, ocean transport, and cities, the world must take immediate action to transition away from fossil fuels. The IPCC report concludes that a world with 2°C of global warming will lead to more heat-related deaths, smaller crop yields, more intense extreme weather events, slower economic growth, more people in poverty, and an increase in the population facing water stress by up to 50%, compared to a 1.5°C world. These impacts will get progressively worse if temperatures warm beyond the 2°C limit. Indigenous Peoples, frontline communities and everyday people around the world, are already facing devastating impacts from wildfires, floods, drought, and food insecurity. The climate science is clear: we must reduce emissions as soon as possible—especially emissions from burning fossil fuels. Negotiations at COP24 are focussed on the implementation of the Paris Agreement with the framework for international action being the Rulebook that will set this Agreement in motion by laying out the tools and processes to enable its full, fair, and effective implementation. Countries agreed to develop and finalize the Paris Rulebook at the COP24. ITR recognized that the adoption of the Rulebook will provide guidance for how countries should implement and strengthen their national climate plans under the Nationally Determined Contributions (NDCs). Real emission reductions happen at the source where they are produced: coal mines, oil refineries, tar sands, fracking, waste incinerators, the aviation industry. Carbon pricing, carbon markets and offset schemes, domestic and internationally, do not cut emissions at source and release dangerous levels of toxic emissions spewing in environmental justice communities located at the fenceline alongside toxic industries, with the erroneous assumption that investments in the conservation of forests and ecosystems in one place can somehow “neutralize” fossil fuel emissions taking place elsewhere. At the same time, the implementation of REDD+ and similar forest-based carbon credit and payment for ecological services schemes have been documented in many instances to have failed to recognize the principles of Free and Prior Informed Consent (FPIC), and have resulted in land grabs, human rights violations and the loss of livelihood for forest-dependent communities. For all of these reasons, Article 6 of the Paris Agreement is a central focus for It Takes Roots and Indigenous and frontline communities impacted by the financialization of nature and carbon pricing and trading schemes. 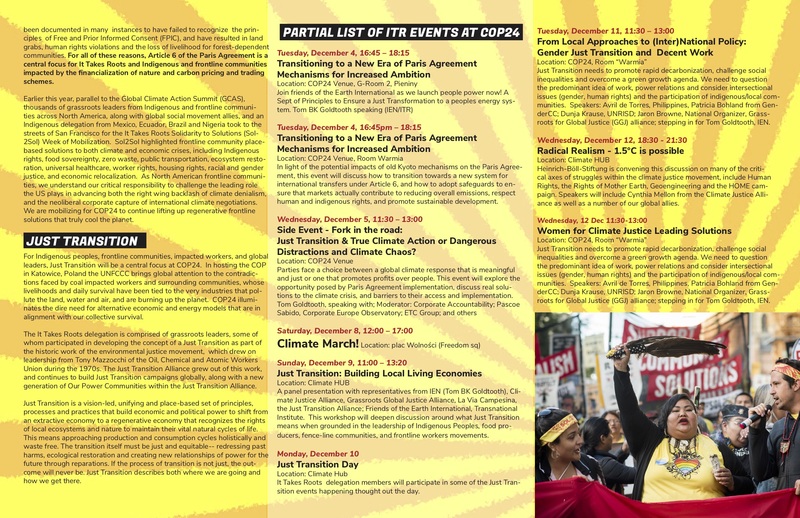 Earlier this year, parallel to the Global Climate Action Summit (GCAS), thousands of grassroots leaders from Indigenous and frontline communities across North America, along with global social movement allies, and an Indigenous delegation from Mexico, Ecuador, Brazil and Nigeria took to the streets of San Francisco for the It Takes Roots Solidarity to Solutions (Sol2Sol) Week of Mobilization. Sol2Sol highlighted frontline community place-based solutions to both climate and economic crises, including Indigenous rights, food sovereignty, zero waste, public transportation, ecosystem restoration, universal healthcare, worker rights, housing rights, racial and gender justice, and economic relocalization. 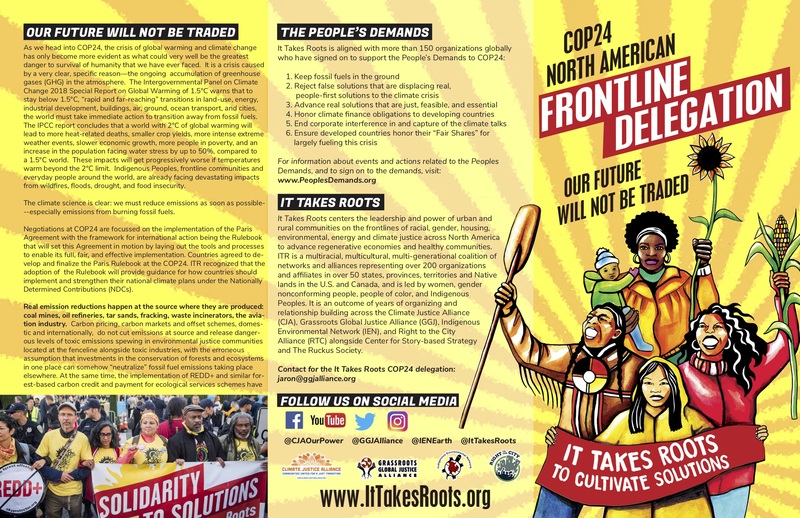 As North American frontline communities, we understand our critical responsibility to challenge the leading role the US plays in advancing both the right wing backlash of climate denialism, and the neoliberal corporate capture of international climate negotiations. We are mobilizing for COP24 to continue lifting up regenerative frontline solutions that truly cool the planet. For Indigenous peoples, frontline communities, impacted workers, and global leaders, Just Transition will be a central focus at COP24. In hosting the COP in Katowice, Poland the UNFCCC brings global attention to the contradictions faced by coal impacted workers and surrounding communities, whose livelihoods and daily survival have been tied to the very industries that pollute the land, water and air, and are burning up the planet. COP24 illuminates the dire need for alternative economic and energy models that are in alignment with our collective survival. The It Takes Roots delegation is comprised of grassroots leaders, some of whom participated in developing the concept of a Just Transition as part of the historic work of the environmental justice movement, which drew on leadership from Tony Mazzocchi of the Oil, Chemical and Atomic Workers Union during the 1970s. The Just Transition Alliance grew out of this work, and continues to build Just Transition campaigns globally, along with a new generation of Our Power Communities within the Just Transition Alliance. 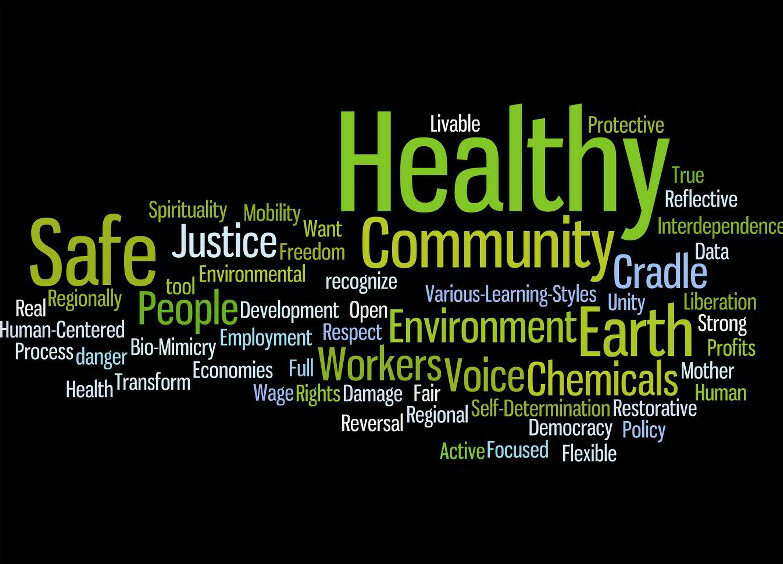 Just Transition is a vision-led, unifying and place-based set of principles, processes and practices that build economic and political power to shift from an extractive economy to a regenerative economy that recognizes the rights of local ecosystems and nature to maintain their vital natural cycles of life. This means approaching production and consumption cycles holistically and waste free. The transition itself must be just and equitable– redressing past harms, ecological restoration and creating new relationships of power for the future through reparations. If the process of transition is not just, the outcome will never be. Just Transition describes both where we are going and how we get there. It Takes Roots centers the leadership and power of urban and rural communities on the frontlines of racial, gender, housing, environmental, energy and climate justice across North America to advance regenerative economies and healthy communities. ITR is a multiracial, multicultural, multi-generational coalition of networks and alliances representing over 200 organizations and affiliates in over 50 states, provinces, territories and Native lands in the U.S. and Canada, and is led by women, gender nonconforming people, people of color, and Indigenous Peoples. It is an outcome of years of organizing and relationship building across the Climate Justice Alliance (CJA), Grassroots Global Justice Alliance (GGJ), Indigenous Environmental Network (IEN), and Right to the City Alliance (RTC) alongside Center for Story-based Strategy and The Ruckus Society.